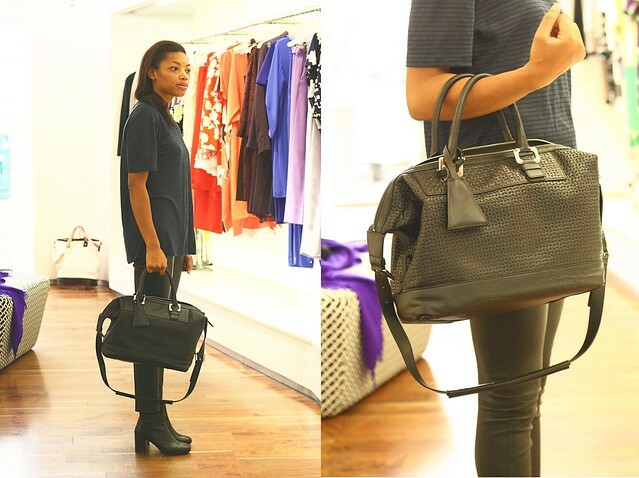 Last week, I was invited by Matches Fashion to take a look at Diane von Furstenberg's handbag collection. Coincidentally, a good friend of mine, Laura or otherwise known as The Enabler has an addiction to DvF clothes. 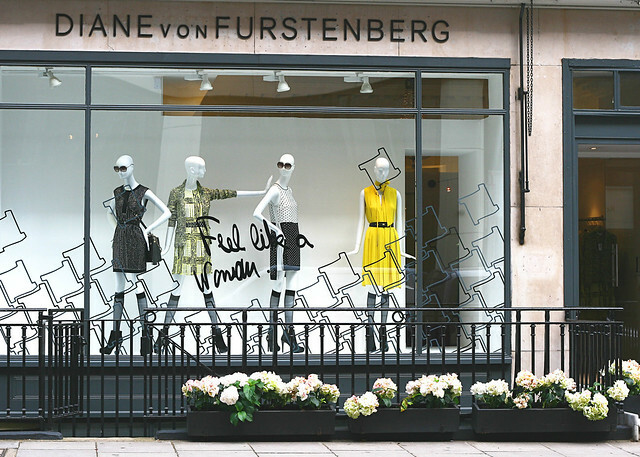 She has been urging me to head over to the one and only DvF store in London for quite sometime now. The Drew Satchel is understated and quietly elegant. It is designed with simplicity and practicality in mind. Personally, I'm glad that designers are now making bags that are functional and versatile. In this case, the Drew Satchel can be hand carried as well as worn on the shoulder and messenger style when one needs to be hands free. The interior is lined in fabric making it relatively lightweight. This is an important factor as I've injured my shoulders on several occasions after lugging around a heavy bag for a couple of days. Simone has kindly agreed to model the bags for me to give an idea of the bags in proportion to her height. Just so you know, she's approximately 5'8 in heels. The Drew Satchel measures 19.5" x 11" x 6" and is large enough to store a laptop and files. It transitions well from a work bag to a weekend carryall for an overnight trip. The leather is supple enough to be folded into a luggage without taking up too much space. My only criticism would be that they need to include feet on the base. The Drew Satchel is very well priced at £441 and available at Matches Fashion. I will be posting a photos of the lookbook of the latest Isabel Marant and IRO collection tomorrow. I can't wait to show you some of the amazing pieces that will be coming in. It must be really exciting and such a compliment to be invited to do a review for Matches! The bag is lovely. Lovely bag :) I have never used any DVF bags, but I love her clothing line. At the moment, I am increasingly inclined to buy really lightweight bags, after wrestling with a bad back recently. Been using a nubuck messenger by Clare Vivier, which is working out beautifully! Bags are so big these days, I'm small and look ridiculous with most of them, which is so annoying. I adore those shoes...cute. My excitement for bags has died down (which is a good thing). I am finally at a stage where i can look at them in peace and not dying to have them..amen...lol. I love big bags like this one. i have to agree with you that one of the flaw of drew satchel got to be the absence of the feet at the base. It keeps the bottom of the bag from getting dirty and also scratches. 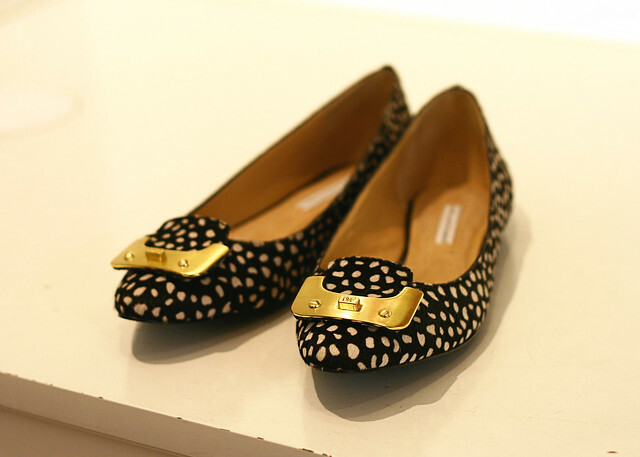 Those shoes are so cute! I don't own anything from DvF even though there are always quite a few things I like in her collections. Can't wait to see the Isabel Marant and Iro lookbooks! Lucky you getting a sneak peak inside Matches - how fab! I have to meet The Enabler, I love DVF too! I've never used DVF's bags, but her dresses are amazing. I love the look of this bag when it`s handheld, not so much over the shoulder. But it is one great design. 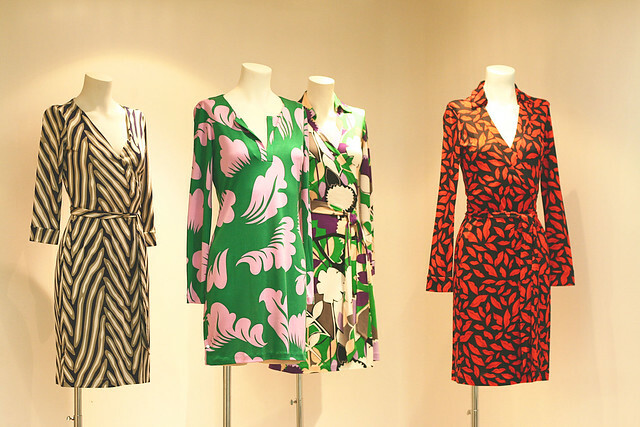 DvF`s designs are beautiful! I looked through their stuff in the sales but was torn away by some other pieces, but in the future: yes, please!! aww- that's nice of them.. This place looks so great- I have to say- I was already sold when I saw the storefront! :D NICE display!